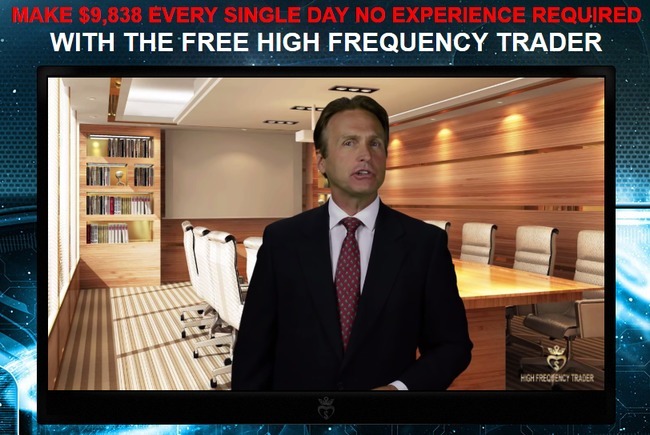 High Frequency Trader Software Review - Scam Alert! High Frequency Trader is another generic binary trading software that promises to make its users thousands of dollars daily profits. I’ve reviewed many other similar frauds, and today I add High Frequency Trader scam to the list. 3 of my readers reporting making a loss of at least $250 within 1 day of activating the system. 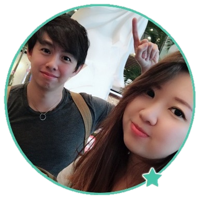 Therefore, if you are still considering to go for it, make sure you read this High Frequency Trader review before funding your account. An auto-trader that makes $9,838 daily profits guaranteed? High Frequency Trader is one of those online scams that lure curious internet users into thinking that there is free money to be made online. You may have been introduced to the sales page via a shady email, a random pop up while you were browsing the internet, or a shiny side banner on some websites. These are all advertisements, and people who refer you to the scams get paid if you sign up and fund your trading account. Be extra careful if you find opportunities that sound too good to be true on the internet. Once the funds have been lost, it is not recoverable because it’s lost in poor trades. While High Frequency Trader scam may promise you guaranteed profits, binary options is actually one of the most risky investments out there. The odds of you making consistent profits is not better than gambling in casino, and it’s so risky that even Forbes warned us against gambling on binary options. With that said, there are actually ways to tell if an online opportunity is a scam without having to pay for it. Let’s look at some evidence to show that High Frequency Trader is a scam. Due to the high number of fake profiles used in online scams, I make it a point to conduct a background check for every member featured in High Frequency Trader to make sure they are the real deal. Since the only identifiable feature of these members is the profile pictures, I conducted a reverse lookup based on these pictures. Unsurprisingly, all of the members above were fabricated using stolen pictures from all over the internet. 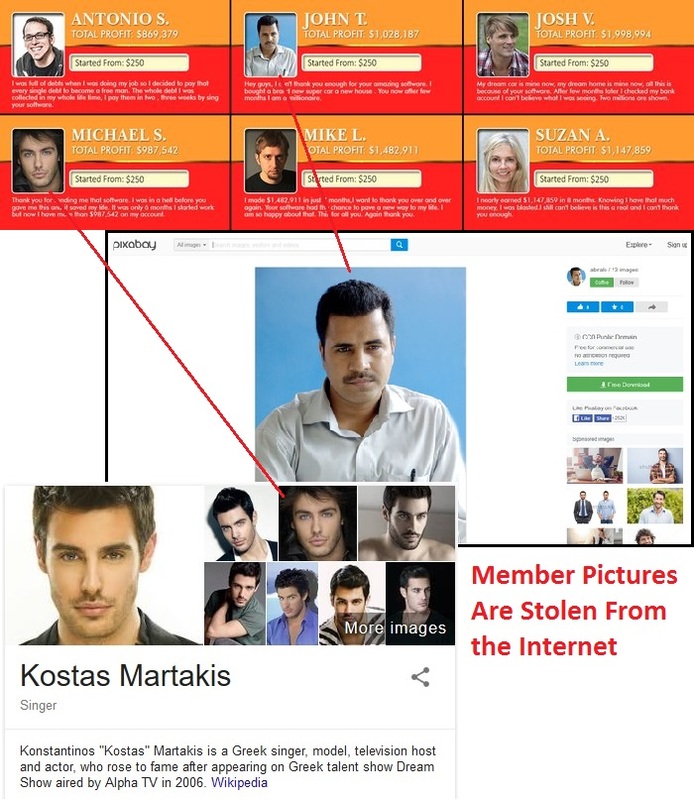 Interestingly, one of the members “Michael S.” was fabricated using the picture of a famous Greek personality called “Kortas Martakis” (screenshot above). There is no way he is called “Michael S.”, let alone making money from a piece of shady trading software. This just shows that the scammers behind High Frequency Trader scam will go as far as to fabricate fake profiles and lure their victims into signing up for the scam. If you have traded binary options before, you would know that the market is closed during the weekends, just like the stock exchange and the Forex market. In other words, you can’t perform any trades on Saturdays and Sundays. 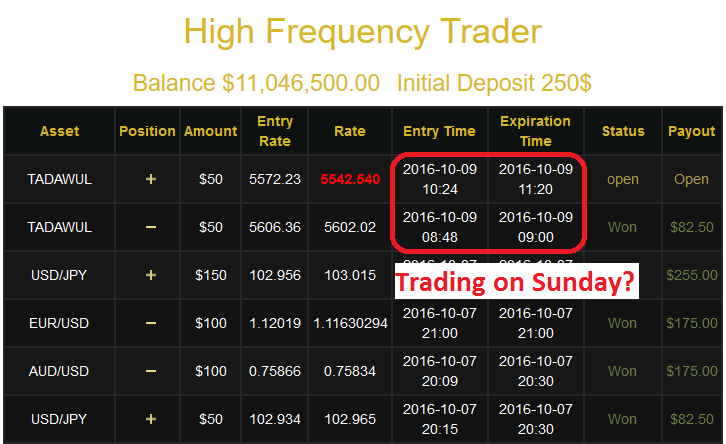 However, according to the “Live Trades” table displayed on High Frequency Trader website, the system was still making profits on 9 Oct 2016, which was obviously a Sunday. There is only one explanation to this phenomenon – the “Live Trades” table is once again, fabricated to confuse victims. It is actually generated using a computer script that pairs up the current date and time with random asset groups and profits to make people think that its generating real trades. The same tactic has been used in several other scams I’ve reviewed recently, such as Dream Catcher and Compound Trader scams. There are no real trades and profits behind these numbers. Don’t be the next victim who is convinced by this common fraud tactic. If you decide to sign up for High Frequency Trader app, you will be required to open a new broker account with their partner brokers, which are unregulated by monetary authorities. The losses are pocketed by the broker, which is then shared with its partner-in-crime – the scammers behind High Frequency Trader system. HIGH FREQUENCY TRADER IS A SCAM. I strongly advise you to stay away from the scam if you don’t want to lose your hard-earned money.